So the last few days, I’ve discovered a few cool tools/services that are being offered to help preserve the Tibetan language. Earlier this week, I was browsing Facebook, when I saw a photo pop up on my news-feed. The photo was actually a poster for a free online Tibetan languages class being provided by Online Buddhism Class. I thought this was genius. The class was being taught by a Tibetan (at least I’m assuming through the name), it was live and interactive, and best thing is, you can attend class from the comfort of your home. I’ve spoken to other Tibetans around my age before who were interested in taking a Tibetan class to learn or improve their Tibetan, but didn’t have access to any, or if there were classes in their cities, they were aimed at young children, making it awkward for us older people to sit in a class full of 6-year olds reciting thier kha-ka-gah-ngas. I was excited to take part in this class but realized afterwards, classes take place while I’m at work, so I can’t actually attend. Regardless, I thought I’d at least post this info out on Lhakar Diaries for anyone interested. I’ve never actually heard of Online Buddhism Class before, so I can’t vouch for the quality of their service, but I definitely think it’s worthwhile to check out if you’re free Wednesday mornings at 9amEST. Would love to hear from people who have or are taking part in this. For now, I’ll just keep an eye out for classes being offered when I’m not at work. I don’t know know why no one’s thought of this before (or maybe it’s just me who’s never heard of this before)! 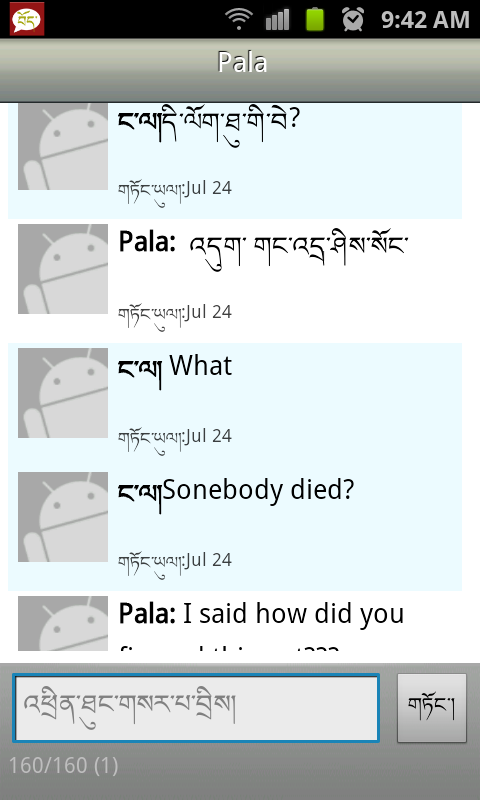 Also, a couple of days ago, a friend called me asking about Tibetan fonts for the Android since he just made the switch from the iPhone to an Android. Although I’ve tried countless times, I still can’t figure out how to get full Tibetan capabilities on my Android. I’ve been able to download a Tibetan keyboard on my phone, and am able to copy and paste text from web browsers into an application that can reveal the Tibetan text, but for applications like Facebook or texting, I haven’t been able to find a way to see the text at all. My friend’s call prompted me to search for Tibetan apps on the Google Play Store for Androids, and I found two neat new Tibetan apps. The first one is called ‘Match English Tibetan’. It’s a REALLY (read: extremely) simple app where 4 words appear on the left written in English, and four on the right in Tibetan text, and you match them up. The app isn’t too exciting or glamorous, but it’s definitely, a neat little time passer if you want to practice your Tibetan reading skills in the most simplest of forms. I’m not 100% how accurate it is since I haven’t been able to ask someone who really knows how to read Tibetan to check for accuracy and I haven’t been able to recognize some of the most simplest of words like ‘cat’, but then again, my Tibetan skills aren’t the greatest. Would also be great to hear from people who are using this app to let me know if this app is in fact accurate. Obviously, from this conversation you can see I really need to take that online Tibetan class. According to what my teacher told us, Hortsang Jigme La started learning Tibetan language and literature at the age of 16 or there about, and now as we can see, he is one of the most profilic Tibetan writers at work today. Indeed the word impossible says, I’m possible (another quote from my teacher). Now I really wish I could attend these classes! Yep, he is a big guy. I don’t know about his current whereabout but his family used to run a bookstore in the ground floor of a brand new plaza not too far from Lhasang Tsering’s bookworm in Mcleod Ganj, Dharamsala. In early 2000s he wrote a damning article on Jamyang Norbu in Tibet Times. I think it was a rebuttal to ‘After the Dalai Lama’ article in Newsweek. He went on to become the member of Tibetan Parliament. Good online Tibetan lessons are available from Esukhia. They are not free, but they are very good value and the project provides work for many Tibetan teachers living in Dharamsala. The Tibetan Language Class is now on Saturdays at 9am. Also, our genla is now Chok Monlamla from India. That’s right. Tibetan Language and Buddhism classes are provided on Saturdays and Sundays.